I got myself a resident pass for the local lighthouse thinking it would give me a discount on future admissions. I was pleasantly surprised to learn that it grants you free admission for a full year! The breeze at the very top over 100 feet above sea level is a welcome escape from the heat and humidity. History: Originally built with coquina in the 1700s, but collapsed three years after the modern day lighthouse was completed in 1874. Maintenance: To deal with mold growth, the exterior of the lighthouse must be cleaned regularly. In the past, scaffolding or harnesses were used to get the job done, but it proved to be costly and dangerous. Most recently, a system was formed in which a suspended pressure washer controlled by lines that run from the ground to the top of the tower sprays a diluted bleach solution. 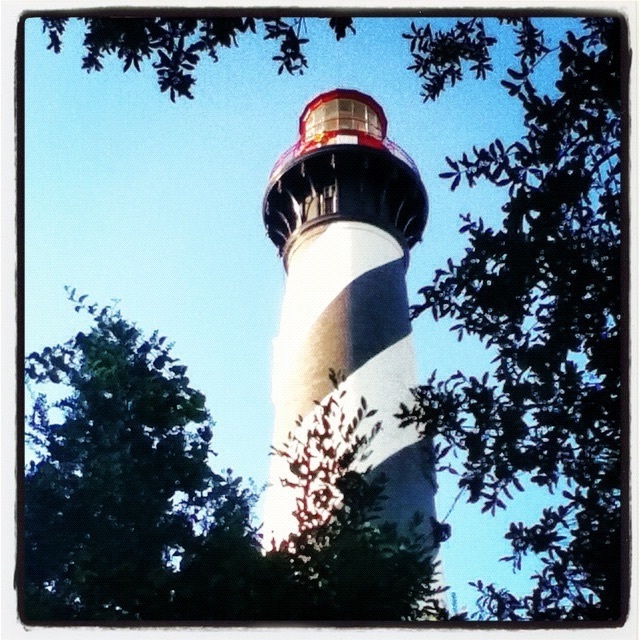 Connection to Women's History: In the 1800's, Maria Andreu served as the first female lighthouse keeper. Special Events: Once a month, visitors can enjoy "Sunset Moonrise" for a unique view of the sunset and rise of a full moon. The event includes champagne and hors d'oeuvres served when climbers reach the top. Refreshments are courtesy of San Sebastian Winery and The Reef.